If you’re like me, then you grew to love the game of darts during college when you played it in the rec center and then at local bars. It’s a fun game that people of all ages and skill levels can play together, and playing when drunk makes it even more challenging. But when you want to play without going to the bar, what do you do? You get yourself an awesome dart board for home and work on perfecting your dart throwing skills! Of course, there’s a lot of options out there from the top dart board brands to new entries on the market. Doing a little research of the types of dart boards available will ensure you have the right board for your needs. Below our editors give you some tips on what to look for, as well as answer the question – what is the best dart board on the market – based on our editor reviews. editor selections below based on value and quality. **This page contains some affiliate links and GamingWeekender may be compensated if you make a purchase after clicking on the links. The list above showcases our editor’s favorites and they are they top rated dart boards reviewed by our team here at Gaming Weekender. Keep in mind that while these are the favorite options discovered by our editors, you may discover other boards that meet your needs better. If you’re looking for a quality bristle dart board for some recreational games of darts at home, then we believe that the Winmau Blade 5 Bristle Dartboard is the best bristle dart board for the money. This is a professional quality board intended for recreational use, and it has the distinction of obtaining the exclusive British Darts Organization (BDO) endorsement. One of the things that we really like about this one is that it is super durable, which makes it a great option for a good dart board for the garage or basement rec room. One of the things that makes it so durable is the Carbon Diffusion technology in bullseye ring for stronger steel. 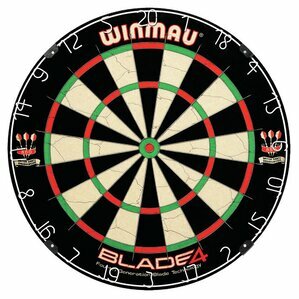 If you’ve played on the Blade 4 dartbboard and are thinking – Winmau Blade 4 vs Blade 5, what’s the difference, then you’ll notice that the Blade 5 has a larger scoring area with 14% thinner wiring system. Plus, the board offers reduced bounce-outs and improved dart deflection with 30-degree reduction in razor wire angle. The only downside of this dart board is that it doesn’t come with any darts, so you need to buy those separately. Winmau Blade 5 Bristle Dartboard vs Winmau Blade 5 Dual Core Bristle Dartboard – If you’re trying to decide between the two of these, then let us help you out. The bristle on the dual core is more compressed, which makes it one of the best professional tournament quality dartboards that you can get right now. Honestly though, unless you want bragging rights or you want to prepare for tournaments, you really don’t need the Dual Core model. If you’re interested in something that offers a little more in terms of features than your standard dart board, then we highly recommend the Arachnid Cricket Pro 800 Electronic Dartboard. At this time, our editors feel that this is the best electronic dart board for the money. There is a lot to like about this electronic dartboard. It offers a full regulation 15.5” target area, which makes it the perfect tournament quality electronic dartboard for home use. One of the really cool features you get this this model is that it offers 39 games with 179 variations (7 Cricket Games) all built into the board. And even better, it can handle up to to 8 players with 4-Player jumbo X/O LED score display. That makes this a great option for parties or family get togethers. We also like that it seems to be durable and high quality, which makes us think that this is a good investment that will bring you plenty of years of game play. And the sensors seem to be very responsive for good accuracy during games. 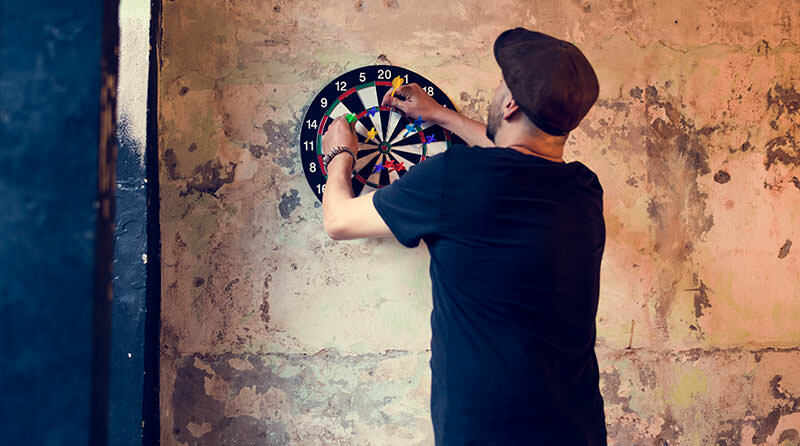 There are several things to keep in mind when buying a dart board for your home. Will the board be used by your children? Are you a serious league or tournament player? Where will the dart board be? Let’s look at the available types of boards, ranging from kid-friendly to those for people with a more competitive edge. Bristle Boards. Bristle boards are the most durable and are most commonly used in tournaments and leagues. They’re made from a material called sisal. The fibers of the Sisal plant are very forgiving and move aside when a dart is thrown into them. They return to their normal shape when darts are removed. The fibers are attached to the backboard, then surrounded with metal wiring, which creates the targeted rings for scoring. Most bristle boards are uniform in size. Their diameters are 18 inches wide. High-quality bristle boards have a movable outer ring, which extends the life of the board. For game play, you’ll need to use darts with a sharp steel tip to penetrate the sisal. Keeping score is normally done manually, although some bristle boards do have score keeping options. Electronic Boards. Electronic dart boards are the next most popular. They’re a big hit with those who enjoy the game and can be found in arcade game rooms and taverns. These boards boast colorful displays and keep score for you. Some boards will keep score for up to eight players and will automatically include a player’s handicap score. Depending on the board, you can use either soft plastic darts or steel-tipped. The surface of the board is made up of holes which the darts enter. This is also how the board keeps score for you. Sizes of electronic dart boards vary and some offer sound effects. Wooden Boards. Wooden dart boards aren’t as popular as they used to be and they’re very difficult to find. Although using steel-tipped darts on them doesn’t cause damage, be aware that they tend to crack as the wood becomes dry. Coiled Paper Boards. Coiled paper dart boards are a cheaper version of bristle boards – both in cost and quality. They are made of paper that is tightly coiled together. Darts will go in between the paper. The paper should then “heal”. The paper is fragile and will tear easily if your darts aren’t sharp. Coiled paper boards are a good choice for kids or for light use. Cork Boards. Cork dartboards are made of just that—cork. They break easily and don’t last long. A cork dart board isn’t recommended for longevity. They’re also difficult to find. Cork dart boards are mainly geared towards children’s play. Magnet Boards. Magnetic dart boards use only magnetic darts. Higher quality magnetic boards can be found, but mostly these types of boards are for occasional use or for children’s play. They aren’t very accurate, as the darts don’t stick unless thrown a certain way. Now that we’ve discussed the types of dart boards, let’s look at some of the finer features and options to consider. If you’re looking for a long-lasting, durable board, the bristle board is your best bet. High-quality bristle boards are staple free. They also come in different depths and density. A board with thicker density will last much longer than a thinner board. The wire surrounding the scoring area should be made of thin wire. Some bristle boards have numbers that can be removed. Some bristle boards are customized. You can find them with your favorite football team’s emblem, animals, or even a Harley Davidson emblem. Electronic dart boards offer storage areas for your darts. They’re equipped with sights and sounds to enhance your playing time. Electronic dart boards are a good choice for introducing the game to younger family members. Do you want a built-in score keeper? Some dart boards offer this functionality. Do you want a board that comes with a set of darts? Or do you prefer to buy your own? Some dartboards come with everything you need to start playing a game of darts immediately. Additionally, what type of darts do you prefer to play with? This is an important question because certain types of dartboards can only be used with certain types of darts. So, if you already have a dart preference, then keep that in mind when shopping for a new dartboard for yourself. Purchasing a dart board for your home or office is a good way to save money that you’d normally spend at a bar or arcade. The better the board, the higher the price. Keep in mind where you’ll be using your dart board. A bristle board would be a wise choice for the office or home. An electronic dart board could be a distraction for fellow workers due to the lights and sounds. Either dart board would be a great addition to your home, and the electronics would be especially beneficial if you have younger children. Steel-tipped darts could be dangerous for the younger crowd. Also, keep in mind how serious gameplay is to you. If you’re interested in league or tournament playing, the bristle board would be the best choice. If you’re looking for a casual board for the entire family, choose the electronic or even magnetic board. The game of darts is a great way to bring family and friends together in the comfort of your own home. Investing in the right board can ensure years of fun.